The VertiMetric utilizes accelerometer technology to analyze and interpret a subject's vertical jump height and power delivered by the lower extremities. With the VertiMetric, users are no longer required to go through setup of large wall mounted apparatuses or to land on small mats. The user simply straps the accelerometer to his or her leg and jumps. 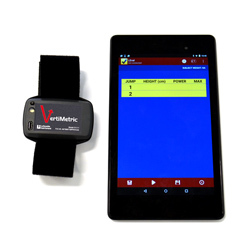 The VertiMetric is the ideal device for measuring and recording vertical leap and leg power for fitness evaluations, athletic combines, and university research. Its portability, wireless transmission, and storage capability give you the perfect combination of a quick and easy to use hand held device that also provides the flexibility to store and analyze your data. Model 01111 contains a VertiMetric device and an Android tablet. For users who already have a tablet, Model 01111S is available with only the VertiMetric device. Dimensions: 2.68" x 2.13" x .71"
The VertiMetric uses an accelerometer that is connected to a tablet to score and save jump sequences.